A professional PDF program to convert your native PDF files(scanned PDFs not included) into editable iWork Keynote format. Edit the PDF file or re-use the PDF data in iWork Keynote would be quick and effortless. - Convert native PDF files to fully editable Keynote files. - Support drag-n-drop multiple PDF documents and batch converting to save your time. - The origianl text, tables, images, hyperlinks and layouts will be preserved in converted Keynote file. 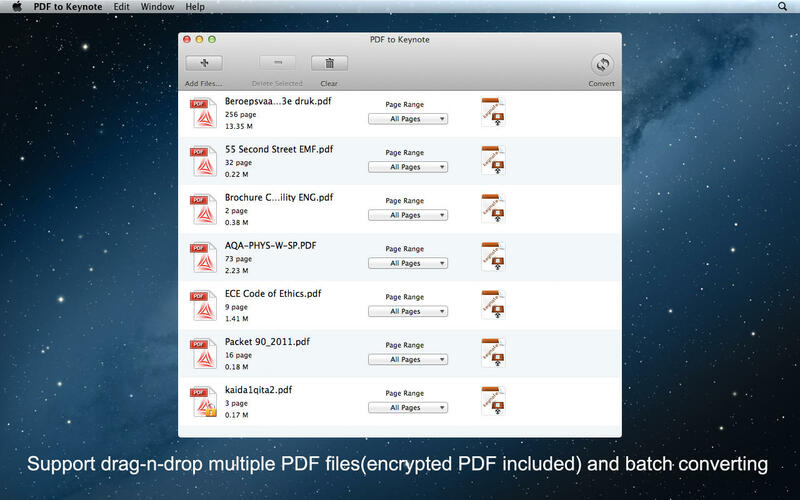 - Support encrypted PDF to iWork Keynote format conversion. - Can convert the specified pages or page ranges of your PDF as need. - Lightning quick conversion speed. - Fully support OS X 10.10 Yosemite now! This version of PDF to Keynote support importing scanned PDF files and converting them, but the converted Keynote documents are not editable. 1. Mac OS X 10.10 Yosemite supported.